The release of the new Bond film Skyfall this year, with the theme by our very own Adele, marks the 50th anniversary of the famous spy series, and has prompted renewed discussion about the theme tunes used over the years. 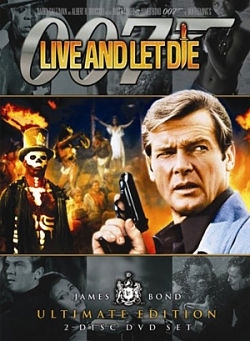 ‘Live And Let Die’ by Paul McCartney & Wings was actually recently voted the best James Bond film theme by BBC Radio 5 Live and BBC Radio 2 listeners. Having worked closely with this track in our exciting new Rock Your GCSE Music series, it has been at the forefront of my mind for several months and got me thinking about what makes a good Bond song! The Rock Your GCSE Music series showcases eight popular songs in a way that helps teachers to teach GCSE skills through the medium of great music and helps students to master an ensemble performance of each one. ‘Live And Let Die’ seemed a perfect choice for this project and the more I worked with it the more I grew to like it. I love the contrasting sections and the way it is so diverse. I think students will get a lot out of studying it – for starters they’ll probably know it well by the Guns n Roses version or for its appearance in Shrek 2 but this might be a new version to them, and it has lots of interesting elements to make it an exciting track to study and play. It covers a range of styles and musical techniques by way of the different sections of the song form, from a clear intro section to an up-tempo rock section, a modulation, and even a reggae section. It has interesting chords/harmonies and variations in tempo, and plenty of drama. The varying song form allows the performer to practise swift changes of key, tempo and mood – keeping them on their toes like a James Bond theme should! The Bond themes are fantastic at representing the films they were written for and the era they were written in. The original orchestral Bond theme from Dr. No is the Daddy of the Bond films with its unmistakable, tense opening guitar riff and loud brassy moments. This theme tune ends on a fantastic chord that leaves you feeling a real sense of excitement as to what’s coming from the film and the action man himself. Personally, my favourite Bond theme has to be ‘Licence To Kill’. I do prefer this Bond theme to ‘Live And Let Die’, although it comes a close second! There are moments, resulting from the dynamics and pleasing harmonies of this song, that makes the hairs on the back of my neck stand up. It’s dramatic and mysterious from the very outset and retains my attention throughout. I have been known to belt this out in the car when I’m by myself! I canvassed the editors here at Music Sales about their favourite Bond themes – do you agree with them? What’s your favourite and why? And how is ‘Live and Let Die’ going down with your students? Do you like the new Skyfall theme? Let us know – our contact details are on the right. This entry was posted in Guest article on October 9, 2012 by Lizzie Moore.